Much of the talk regarding this film has been over Nicole Kidman’s performance as Charlotte Bless and for good reason. The actress puts forward a very bold and memorable turn that will shine brightly next to her already impressive career. More akin to her work in Gus Van Sant’s To Die For (1995) than more recent roles, she pouts, teases and burns through the screen for the duration of the film. Cusack is in fine form and is creepier than ever as Van Wetter. His performance is offputtingly, vile and concentrated. It is also his finest work in well over a decade. McConaughey has another layered and charismatic performance to add to his resume. Oyelowo (recently seen in Jack Reacher, 2012) is also great in his supporting role and proves that we should be seeing more of him on screen in the future. 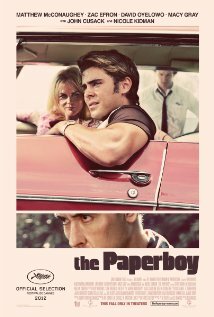 Despite the doubters and his teen dream legacy, Efron does very well with the character of Jack. He conveys the desperation and loneliness within the character all the while looking very much the part. Jack’s relationship with the family maid Anita (played well by singer Macy Gray) is a lovely subplot that also enhances the main narrative.